One of the transactions you can make on your credit card is a cash advance. Taking out a credit card cash advance is kind of like withdrawing cash from the ATM using your debit card, only with a credit card cash advance you're borrowing cash from your credit limit, not from your checking account. When you take out advance on your credit card, you have to repay the money just as you do with purchases you make on your credit card. 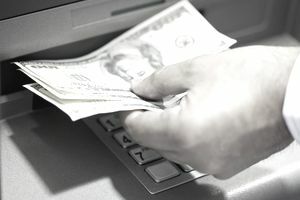 Your credit card issuer isn't really doing you any favors by letting you take out a cash advance, which can be done via ATM or through convenience checks your card issuer sends in the mail. They'll make money off the transaction, by charging a cash advance fee each time you take out a cash advance against your credit limit. That's on top of interest charged starting from the day you make the cash advance. How Much is a Credit Card Cash Advance Fee? The exact amount of your cash advance fee depends on the amount of your advance and the method your credit card issuer uses to calculate the fee. With some credit cards, you can be charged a cash advance fee for cash equivalent transactions. These are transactions that are treated like a cash advance even though you haven't taken out cash from an ATM. For example, you'll also be charged a cash advance fee if you use your credit card as overdraft protection, purchase a money order, put money on a reloadable gift card, buy lottery tickets, or send money to another person. The fee for cash equivalent transactions may be different from the regular cash advance fee. Your credit card issuer is required to disclose the method it uses to calculate your cash advance fee. Refer to your credit card agreement or the back of your billing statement for more information. If you have questions about your cash advance fee, contact your credit card's customer service department by calling the number on the back of your credit card. Know how the fee is calculated before you take out a cash advance so you won't be caught off guard. Can You Avoid a Cash Advance Fee? The only way to avoid a cash advance fee is by avoiding cash advances and cash equivalent transactions on your credit card. If you can't avoid the transaction completely, you can minimize the cash advance fee you pay by reducing the amount of cash you withdraw on your credit card. And since interest starts accruing right away on a cash advance, paying your cash advance back quickly will lower the overall cost of the advance.